Plants pale to bright red, 10-15 (-20) cm tall, with a terete stipe and flat, subdichotomously branched blade. Holdfast rhizomatous or a small disc; stipe a few mm to a few cm long, branched or unbranched; blades 1-4 mm wide, apices tapering, rounded or bilobed. 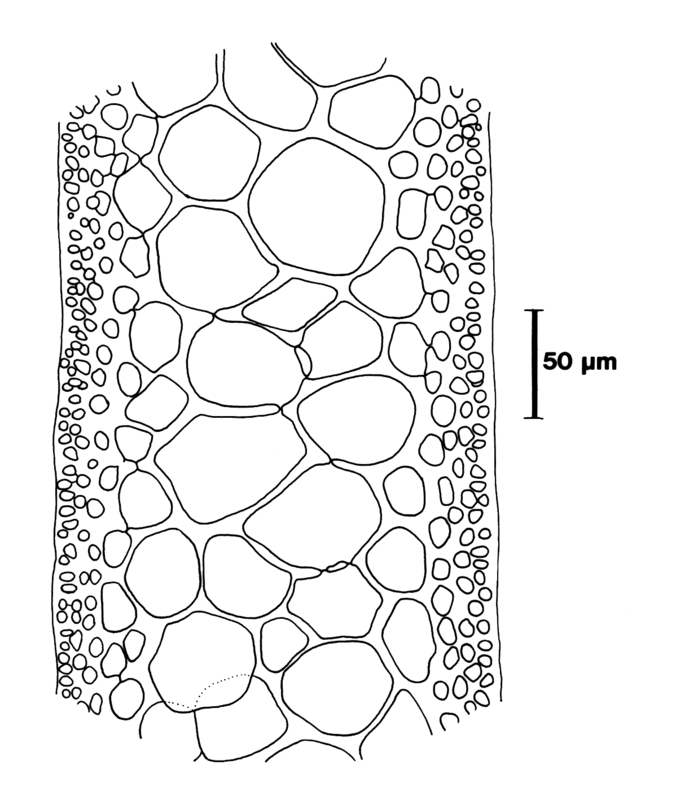 Structure pseudoparenchymatous; medulla comprising several layers of larger cells (to about 60 µm diameter and 2-3 times as long) and cortex of 2-3 layers of small cells (about 5 µm diameter at surface). Reproductive structures borne on small proliferations on surfaces of blades; proliferations simple or tufted, round, wedge- or heart-shaped, up to 10 mm long; cystocarps along margins of proliferations; tetrasporangia in sori covering most of the surfaces. Recorded from Olifantsbos on the west coast of the Cape Peninsula to the Port Alfred area (17-39). Found in the sublittoral fringe and subtidal zone to at least 25m depth. Specimens without reproductive proliferations are often impossible to distinguish from Rhodymenia natalensis, so that the distribution of these two species needs further study. Note: This entity was previously known as Epymenia capensis. (see Womersley 1996). 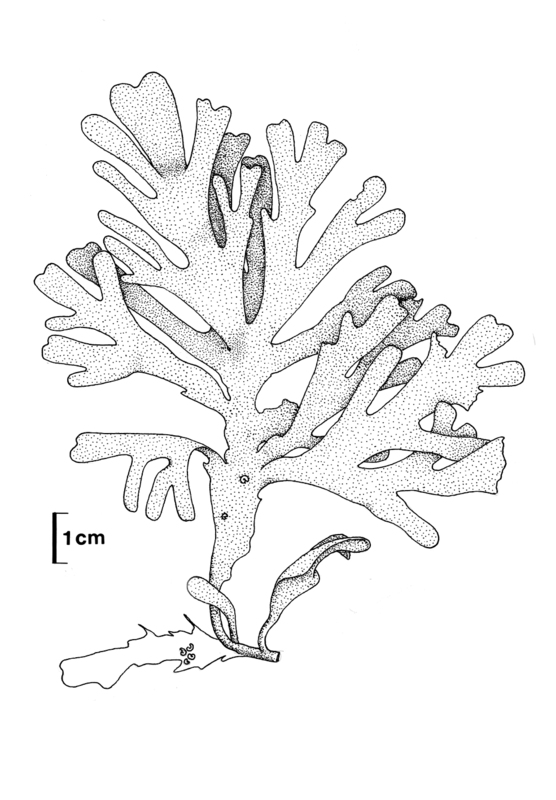 The species requires further study: south and east coast specimens usually have narrower blades (1-4 mm) than those from the west coast (5-8 mm) (see Stegenga et al. 1997). Womersley (1996) includes Epymenia in Rhodymenia, making the new combination Rhodymenia obtusa (Greville) Womersley, but he does not mention Epymenia capensis. We follow Guiry & Guiry (2009) in using R. capensis. Rhodymenia capensis, Three Sisters (BOL). Rhodymenia capensis, habit. Reproduced from Stegenga et al. (1997). Rhodymenia capensis, cross section. Reproduced from Stegenga et al. (1997). Agardh, J. 1894. Analecta Algologica. Cont. II. Lunds Universitetets Arsskrift, Afd. 2, 5 (7); 1-98, 1 pl. Guiry, M.D. & Guiry, G.M. 2009. AlgaeBase. World-wide electronic publication, National University of Ireland, Galway. http://www.algaebase.org; searched May 2009. Womersley, H.B.S. 1996. 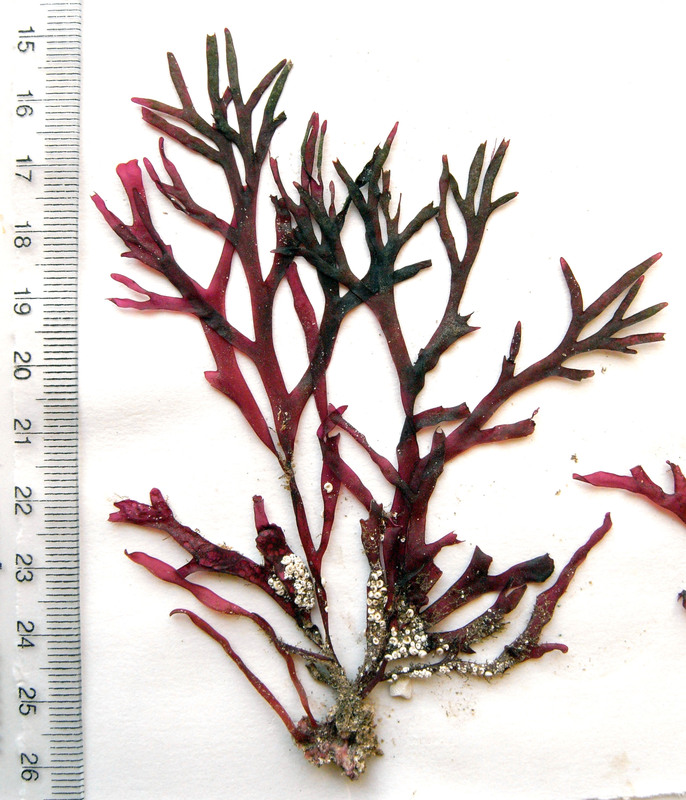 The marine benthic flora of southern Australia - Part IIIB - Gracilariales, Rhodymeniales, Corallinales and Bonnemaisoniales. Vol. 5 pp. 1-392, 160 figs. Canberra & Adelaide: Australian Biological Resources Study & the State Herbarium of South Australia.